2. 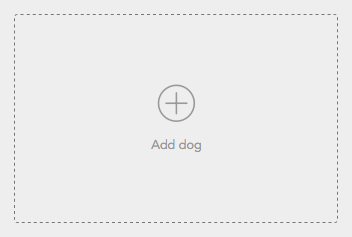 Select Add Dog from your dashboard or profile. 3. Fill out your dog’s profile information. Make sure you add photos! 2. Under the pending requests tab select the correct conversation. 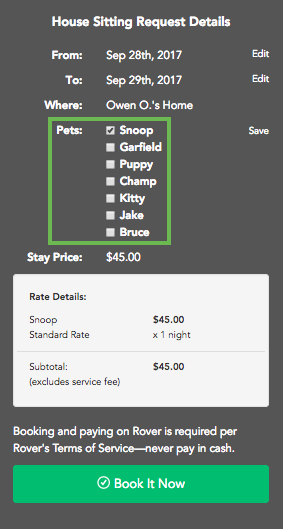 Locate the gray request details box and select Edit next to Pets. 3. Select the checkbox next to the dog you wish to add. 5. Select Book It Now. You're all set! 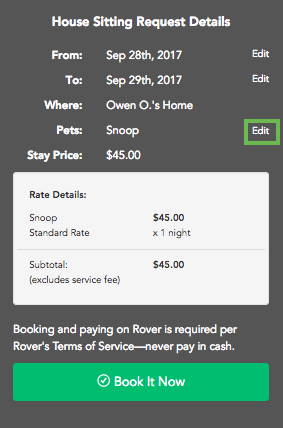 If you need to add a dog to the service after you already confirmed the booking, contact your sitter via Rover Message to see if they can accommodate your request. 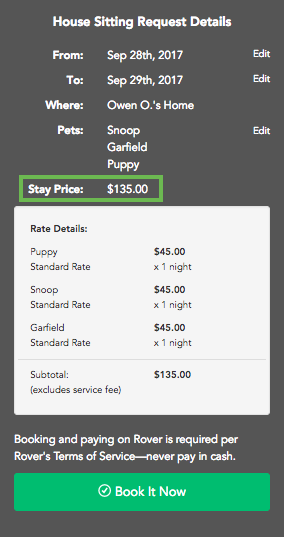 If your sitter agrees, they can modify the booking from their account. Once your sitter makes the changes, you'll need to re-confirm the booking. Learn how to do that here.